Back in the ’70s, Australian television was stocked with cop shows like Division 4, Homicide and Matlock Police and the stars of all these shows were familiar and much-loved faces. 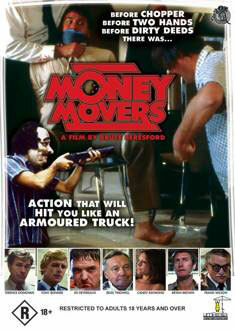 Director Bruce Beresford claims he was unaware of their domestic fame when he assembled a whole bunch of them for his gritty heist thriller Money Movers but the effect is like surfing classic Aussie TV memory waves. Based on a true story by Devon Minchin, the film re-creates the country’s biggest armed robbery of $20 million from a payroll counting office in Sydney, an event that Minchin knew a thing or two about having founded the armoured car company that was involved. In fact, there were rumours that he wrote the book to put everyone off the scent of his own insider job. In the DVD extra Count Your Toes (a reference to one of the films more gruesome scenes), Beresford explains how he found a copy of Minchin’s book in a second-hand shop and adapted it for the screen casting Ed Devereaux and Tony Bonner from the popular kids show Skippy as a pair of security guards with heart. Terence Donovan from Cop Shop, is Eric, one of the baddies and Bryan Brown, in only his third film role, is his younger brother, also named Brian. In the making-of featurette Brown remembers one insightful direction given to him by Beresford just before the cameras rolled; “Now remember Bryan, don’t be boring or else ‘snip snip'”. Whether it was the fear of ending up on the cutting room floor that motivated him to give the magnetic performance that he does or whether it was just his natural-born, charismatic blokey self coming through it’s hard to say but Beresford went on to use him and fellow cast members Donovan and Charles ‘Bud’ Tingwell in his next triumphant production Breaker Morant. This film, however, was not so well received. In fact, it was greeted with “astonishing hostility”, according to Beresford who now agrees that it was “deservedly underrated”. Nevertheless, it is well made and was the first real contemporary crime movie to come out of this country. For that alone it warrants a viewing – that is, if you can handle an eyeful of bloody shoot outs, fist fights and the aforementioned digit removal.